Charles Collins "Ki" Aldrich (June 1, 1916 – March 12, 1983) was an American football player. He was inducted into the College Football Hall of Fame in 1960. 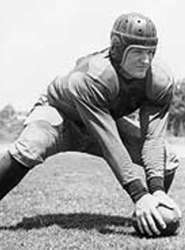 Aldrich was born in Rogers, Texas and attended Temple High School in Temple, Texas, where he was named All-State as a center in 1934. He was an All-American center at Texas Christian University in Fort Worth, Texas. At TCU, he played alongside two legendary quarterbacks—Sammy Baugh and Davey O'Brien. Aldrich's senior year, 1938, the Horned Frogs won the National Championship, finishing 11-0 and winning the Sugar Bowl. The Chicago Cardinals made Aldrich the first selection in the 1939 NFL Draft, in which his TCU teammates O'Brien and I. B. Hale also were selected in the top ten. He played two seasons for the Cardinals before moving to the Washington Redskins. After two seasons in Washington, he left to serve in the Navy during World War II. He returned to the Redskins in 1945, and retired in 1947. During his professional career, Aldrich averaged 50 minutes of playing time per game. After retiring from football, Aldirch served as the superintendent at the Lena Pope Orphanage in Fort Worth, Texas. His first wife was the daughter of the founder. He died March 12, 1983 in Temple, Texas. His coach at TCU, Dutch Meyer, said of Aldrich: "That boy wanted to play football more than anyone I ever knew." Baugh called him "the toughest player I ever knew." Aldrich was inducted into the College Football Hall of Fame in 1960 and was named to the Southwest Conference's All-Time Team in 1969. 1 2 "Inductees". Texas Sports Hall of Fame. Retrieved 2015-10-23. 1 2 3 4 5 6 "Hall of Fame – Inductee Detail: Ki Aldrich". College Football Hall of Fame. Retrieved 2015-10-23.